Grace Fullerton, Class of 2020, won Honorable Mention in the 19-21 age group for the 2018 Live Deliberately Essay Contest put on by the Walden Woods Project! You can read her essay here. This year’s contest saw a record number of entries, with over 2,400 submissions across three age groups. This year’s prompt was “In an essay of 750 words or fewer, describe a time in your life when you pursued a path that was ‘narrow and crooked,’ but felt like it was the right path for you. In what ways are/were you able to, as Thoreau advises, walk that path with ‘love and reverence?’ How has navigating that path shaped you into the person you are becoming?” The essay was an assignment in Dr. Mari Elise Ewing’s Janterm course, “A Deliberate Life,” which explored meaningful ways to live a more environmentally and socially sustainable life. Grace wrote about lessons she learned in Ecuador during a gap year. 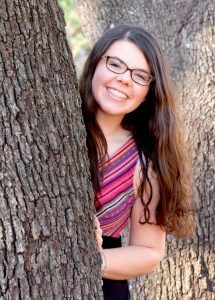 Originally from Austin, Texas, Grace plans to pursue a career in education after graduating.